Our views of the importance of nature and our place within have changed dramatically over the the last century, and the prevailing paradigm has profound influences on conservation from the science that is conducted to the policies that are enacted. In a recent perspectives piece for Science, GEE’s Professor Georgina Mace considered the impacts that these perspectives have on conservation practise. Before the late 1960s, conservation thinking was largely focussed on the idea that nature is best left to its own devices. This ‘nature for itself‘ framework centred around the value of wilderness and unaltered natural reserves. This viewpoint stemmed from ecological theory and research, however by the 1970s it became apparent that human activities were having severe and worsening impacts on species, and that this framework simply wasn’t enough. This led to a shift in focus towards the threats posed to species by human activities and how to reduce these impacts, a ‘nature despite people‘ approach to conservation. This is the paradigm of protected areas and quotas, designed to reduce threats posed and ensure long-term sustainability. By the 1990s, people had begun to appreciate the many and varied roles that healthy ecosystems play in human-wellbeing; ecosystem services are crucial to providing clean water, air, food, minerals and raw materials that sustain human activities. 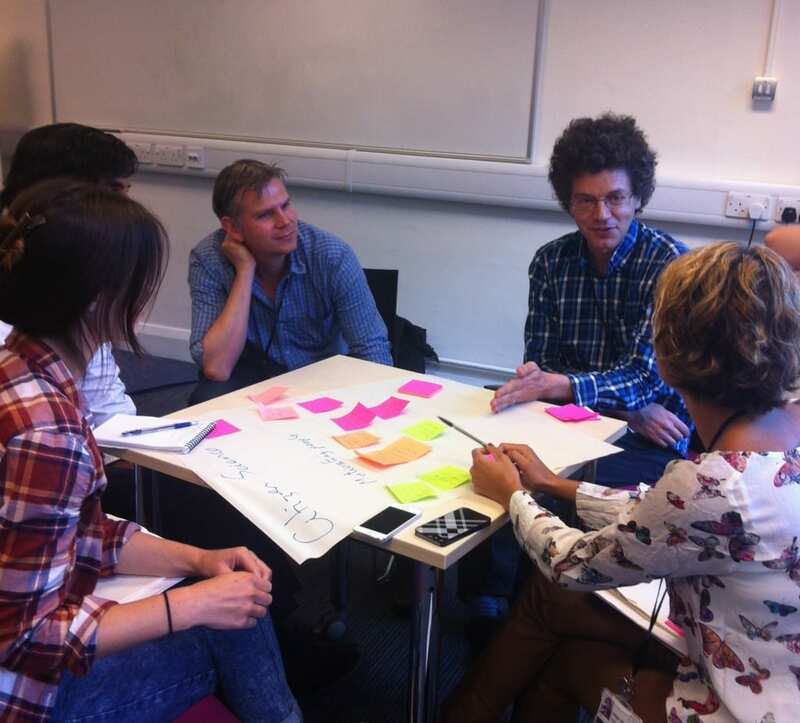 Shifting towards a more holistic, whole-ecosystem viewpoint which attempted to place economic valuations on the services nature provides, conservation thinking entered a ‘nature for people‘ perspective. 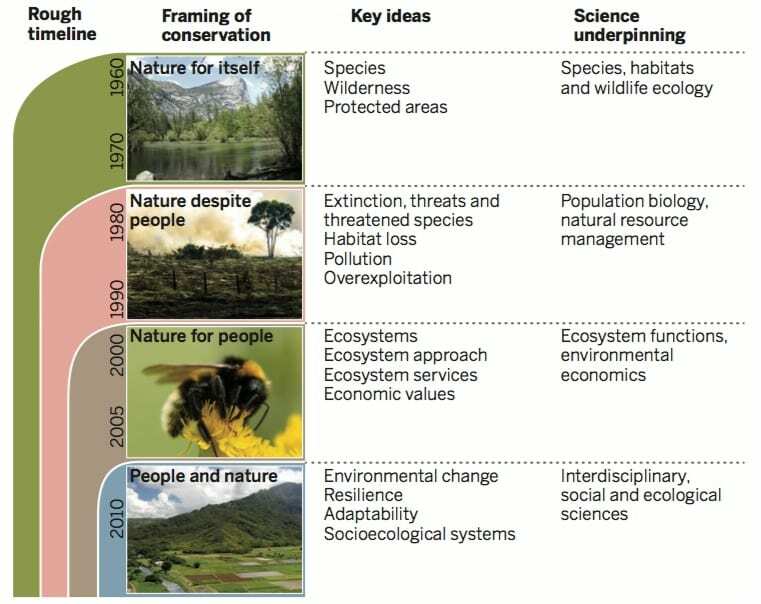 Within this framework, conservationists began to consider new metrics, such as the minimum viable population size of species and ecosystems, and became concerned with ensuring sustainable harvesting and exploitation. In the last few years, this view has again shifted slightly, this time to a ‘people and nature‘ perspective that values long-term harmonious and sustainable relationships between humans and nature, and which includes more abstract benefits to humans. Changing conservation paradigms can have a major impact on how we design conservation interventions and what metrics we monitor to assess their success. Standard metrics of conservation, such as the IUCN classification systems, can be easily applied to both a ‘nature for itself’ and a ‘nature despite people’ framework. In contrast, a more economic approach to conservation requires valuations of ecosystems and the services they provide, which is far more complex to measure and calculate. Even more difficult is measuring the non-economic benefits to human well-being that are provided for by nature. The recent focus on these abstract benefits may make the success of conservation interventions more difficult to assess under this framework. The scientific tools, theory and techniques available to conservation scientists have not always kept up with changing conservation ideologies, and differing perspectives can lead to friction between scientists and policy-makers alike. In the long-term a viewpoint that recognises all of these viewpoints may be the most effective in directing and appraising conservation management. Certainly, greater stability in the way in which we view our place in nature would afford science the opportunity to catch-up and develop effective and empirical metrics that can be meaningfully applied to conservation. Synthetic biology, a hybrid between Engineering and Biology, is an emerging field of research promising to change the way we think about manufacturing, medicine, food production, and even conservation and sustainability. 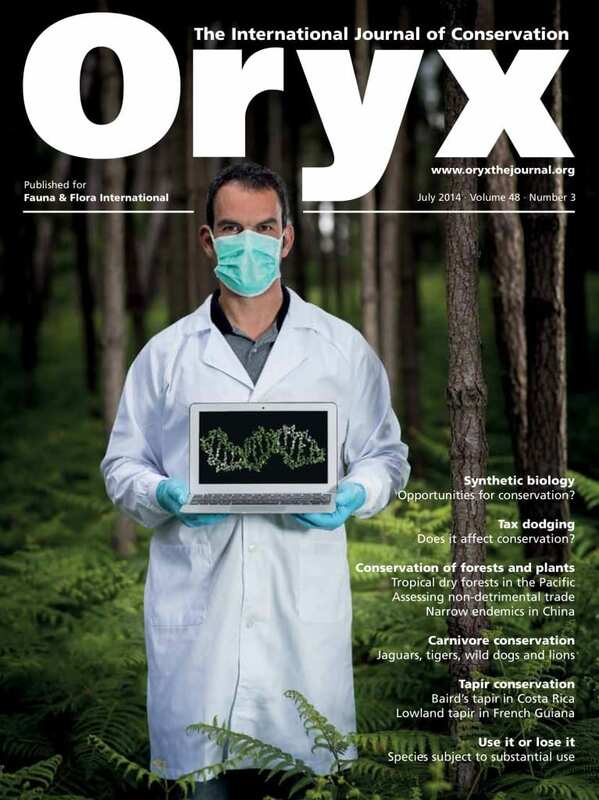 A review paper released this month in Oryx, authored by Dr Kent Redford, Professor William Adams, Dr Rob Carlson, Bertina Ceccarelli and CBER’s Professor Georgina Mace, discusses the possibilities and consequences of synthetic biology for biodiversity conservation. Synthetic biology aims to engineer the natural world to generate novel parts and systems that can be used to tackle real world problems such as genetic disease, food security, invasive species and climate change. It’s implications are far reaching, and although research in synthetic biology began decades ago, conservation biologists have only recently begun to take notice and appreciate it’s relevance to the conservation of biological diversity. 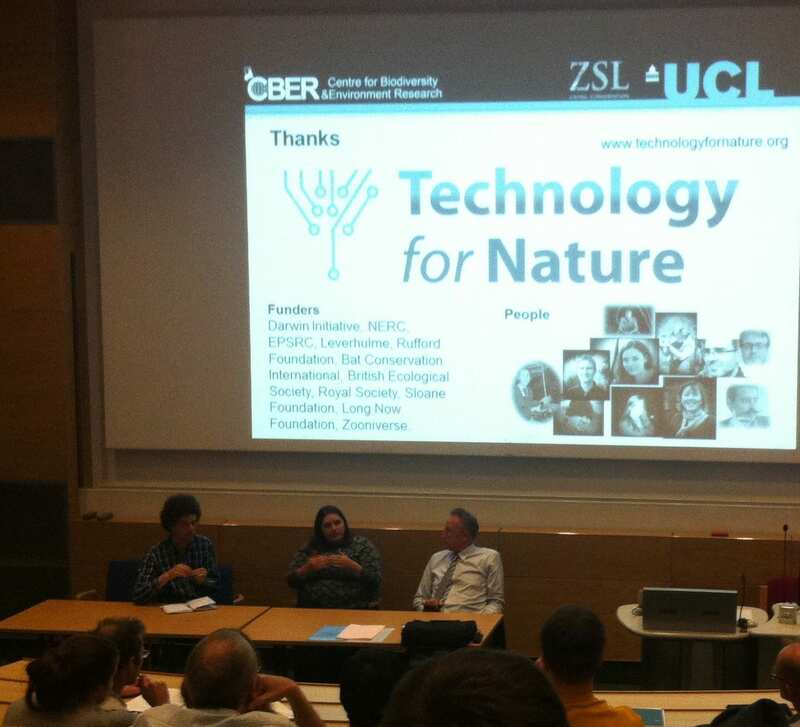 A conference organised by the Wildlife Conservation Society in 2013 discussed the relationship between synthetic biology and conservation, and included speakers from both fields. It might be surprising to find that, despite a similar background in biological research, the shared knowledge and language of conservationists and synthetic biologists is relatively limited. 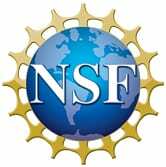 Further, many synthetic biologists come from an engineering background, with little training in ecology. This can make communication between scientists in these fields more difficult, and may have slowed the pace at which synthetic biology has interfaced with conservation science. The two disciplines also employ different methods and think about nature in different ways. Synthetic biology is largely conducted within large, highly controlled laboratory conditions, whilst ecologists work on complex, interrelated natural systems with a major social and political component. Conservationists, working in a high-stakes field and learning from past mistakes, tend to be quite risk-averse in their practice of conservation, whilst synthetic biologists, working in a new science with much to gain from experimentation, tend to be more in favour of taking large risks. They may also have different outlooks on the future of biodiversity – conservations tend to be more pessimistic about the future, mourning past biodiversity loss, whilst synthetic biologists have an upbeat attitude, envisaging the applications of exciting research. Despite these (extremely generalised) differences, the conference revealed interest and excitement on both sides about the possibility of collaborating, and a mutual appreciation that the major challenges of the Anthropocene are human influences on climate, biodiversity and ecosystems. Finding practical, long-lasting and safe solutions to the plethora of challenges currently facing humanity, is of mutual interest. The possible applications of synthetic biology to conservation are many. Synthetic biology might enable us to develop more efficient methods of energy production, freeing up habitat to recover. It could mitigate the effects of greenhouse gas emissions by releasing carbon-consuming algae. It could revive extinct species such as mammoths and dodos in a process known as ‘de-extinction’. It could engineer coral that is tolerant to increases in ocean temperature and acidity, conditions which are predicted to worsen under climate change. It could help to control or eradicate invasive species. It could restore degraded land and water for agriculture, sparing the need to destroy more natural habitat. It could even create pesticide- and parasite-resistant bees that can continue to pollinate our crops generations into the future. However, he potential risks of synthetic biology to conservation are as many as the potential benefits. 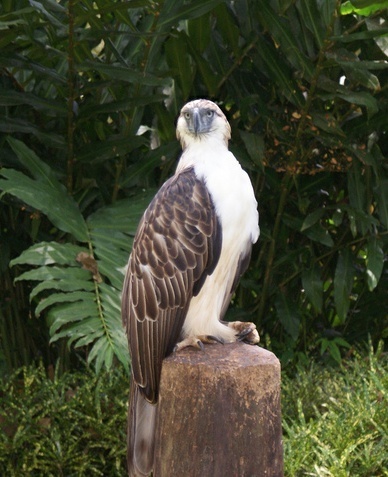 The effects of synthetic biology on conservation could be direct, (e.g. engineering resistant species), or they could be indirect (e.g. changes in land use). These effects could be negative, for example, if they lead to land use change of primary habitat as has been associated with GMOs and biofuels. They could also be positive, for example if they reduce the impact of human activities, allowing habitat to recover to its natural state. Synthetic biology might lead to unexpected impacts on ecosystem dynamics and risks the unintended escape of novel organisms into open ecosystems. Releasing synthetically engineered organisms into wild environments could alter ecosystems, reduce natural genetic variability or lead to hybridisation events that might display native flora and fauna, and generate new invasive species. Synthetic biology might also distract attention and funds from more traditional conservation efforts, whilst attracting protest from human rights and environmental organisations. Both conservationists and synthetic biologists are conscious of these potential risks, and are committed to careful consideration on a case-by-case basis. Not all synthetic biology is the same; some could be of huge potential benefit to conservation and sustainability whilst carrying minimal risks, and it is these that we should pursue.